The movies may have taken a few liberties, but originally stunt motorcyclist, Johnny Blaze, sold his soul to Mephisto (one of the demons of Satan), to save his step father, ‘Crash’ Simpson from cancer. This deal eventually goes completely off the rails with interference from both good and evil forces. And the tormented Ghost Rider is born! He first appeared in Marvel Spotlight no.5, August 1972. Ghost Rider was co-created by Marvel editor Roy Thomas, writer Gary Friedrich and artist Mike Ploog, who to this day can’t seem to agree who came up with the different aspects of the character. 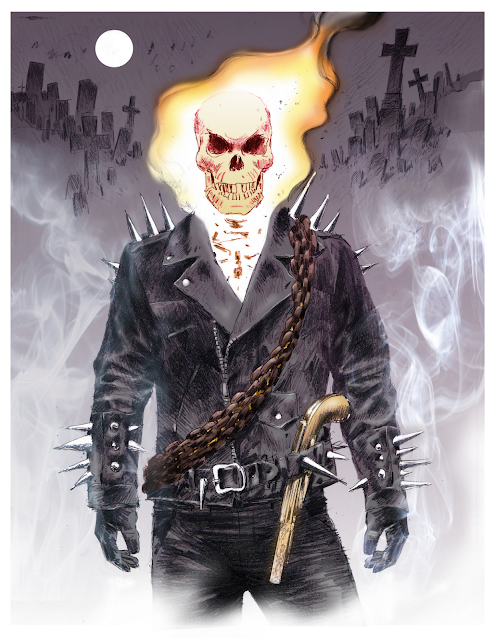 I have added Johnny Blaze to my deviantART Gallery.